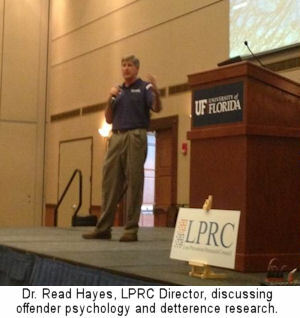 The Loss Prevention Research Council’s 9th annual Impact Conference, held at the University of Florida in Gainesville from October 14-16, drew over 180 leading executives from the Loss Prevention industry, including those from over 35 major retailers. This year’s Impact Conference allowed multiple retail and solution companies to work hand-in-hand addressing different major loss prevention issues via interactive working group and action team breakout sessions. All participants benefited from multiple presentations on this year’s LPRC’s research results and offender interviewing session, using the results to calibrate their upcoming action plans. The LPRC would like to give a special thanks to Bill Titus, VP Loss Prevention & Safety for Sears Holdings Corp., and the rest of LPRC’s Board of Advisors for helping map the organization’s research strategy going forward. Thank you to Dr. Read Hayes for the article and photo submissions.